«Battle Pieces» sounds like a combat plan of ferocities in which virtuosities smash up against one another. But virtuosity in this case is only the basic vocabulary. 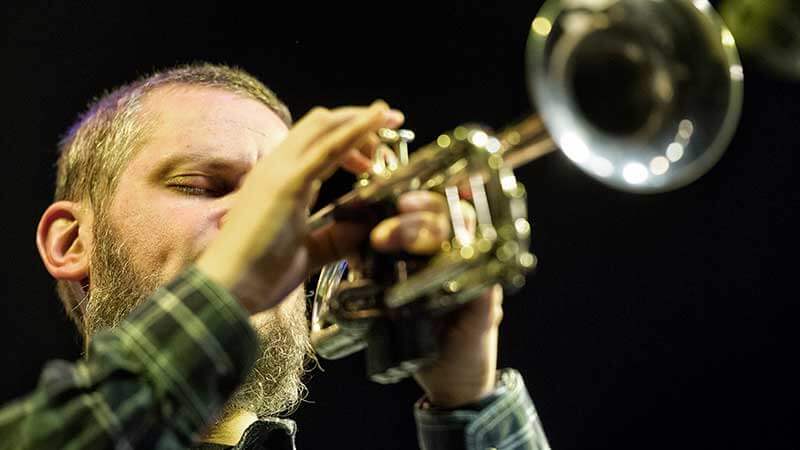 New Yorker Nate Wooley, along with Peter Evans or Taylor Ho Bynum, rank amongst the extraordinary new trumpeters who are breaking new ground with the instrument in terms of sound and playing technique. With «Battle Pieces», he has created a concept which is opening new doors for ordinary improvisation. Each piece is developed for a soloist who improvises freely, while the other musicians spontaneously fall back on a vocabulary now amounting to over 100 composed sequences. The result: «social music»: A freely composed improvisation in continuous flux, brusque and gentle, melodic and adventurous. With the two musicians Ingrid Laubrock and Sylvie Courvoisier, as well as the vibrophonistic sound wizard Matt Maron (The Claudia Quintet), it is no accident that Wooley has musicians on board who are up for a challenging concept – and can rise above one another at any time.